The HBV DR1/X PCR Kit is a real-time PCR assay for the quantification of HBV DNA. The kit provides reagents optimized for rapid and sensitive detection using the Roche LightCycler® 480 or LightCycler® 96 instrument. 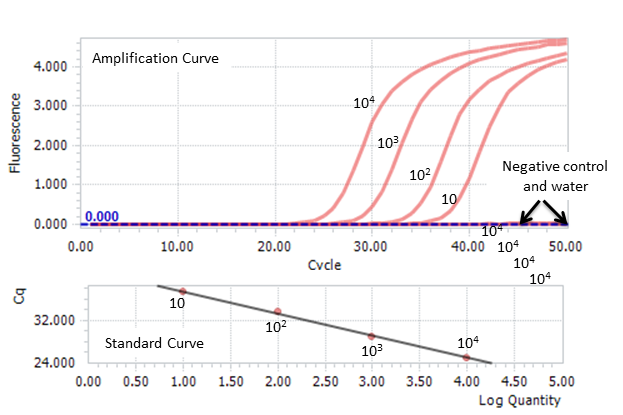 Figure 1: Typical amplification and standard curve generated by Roche LightCycler® 96. Assay shows sensitivity to 10 copies of positive control DNA and linearity from 10 to 104 copies. The HBV DR1/X PCR kit is intended to quantify HBV DNA Genotype C at the DR1/X region of the HBV genome. The kit utilizes SYBR Green dye for quantification on Roche LightCycler® 480 or LightCycler® 96 platform. Reagents in kit includes primer, cloned HBV genome as the positive control and HepG2 cell line DNA as the negative control DNA. There are sufficient amount of reagents for 50 reactions. The kit does not contain LightCycler® 480 SYBR Green I Master. © 2012 JBS Science. All rights reserved.